Indexed in: Book Citation Index, Science (BKCI-S), BIOSIS Previews, EBSCO. As a practicing physician, I found this third edition to be very up-to-date, interesting and useful. It would be an excellent text book for the second semester in the standard twosemester course taught at most pharmacy schools. I was especially impressed with the first chapter on predictive, preventive, personalized and participatory (P4) medicine. It epitomizes the fusion of traditional and western medicine. That is, mathematics, the foundation of reductionist thinking, is used to quantify huge datasets from patients, while physicists, chemists, biologists and engineers develop the analytical tools needed to generate the data. All of this can be linked through the internet and used in mobile healthcare applications. Also, the book concepts and metabolic processes for which there was limited knowledge or was completely unknown when I was a medical student. The information presented provides undergraduate, medical and pharmacy students with useful information about the indications for and applications of modern medicinal chemistry. It will also prepare currently licensed physicians prepare for Board certification and recertification. Many of the old questions may have new answers. I also found the book to be very helpful in describing medicines that I currently prescribe to patients and new drugs that are being developed. On frequent occasions, a patient will ask, “Why aren’t doctors doing more to find cures for common diseases”. The information in this book provides useful answers. I am also frequently asked questions about nutrition, dietary supplements and environmental toxins. The information about these subjects was written in clear, simple language that most people can understand. For example, I am frequently asked if it is beneficial to take the popular supplement, açaí, to help lose weight. Not being from Brazil, I didn’t know anything about it. This book talks about how açaí is 50% fat, as triglycerides. It is an excellent source of calories and antioxidants for undernourished natives and highly competitive athletes who need more calories. Taking açaí will actually make you gain weight. So, the book is very readable and has a multi-disciplinary approach. It teaches the kind of things that I would like to see medical and pharmacy students learn and could even be useful to lay people. 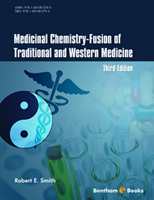 This book was written as a textbook for the second semester in a two-semester a course in medicinal chemistry that is taught in most pharmacy schools. It is preceded by the first edition, which was written for a one semester course and the second edition, which is for the first semester in a two semester course. They can be used in standard courses for pharmacy students and for students who are trying to get into medical, dental, pharmacy or graduate school. Moreover, people working in the pharmaceutical industry and doctors preparing for Medical Board Exams will also find it useful. The second edition discussed the fusion of traditional and western medicine and between systems thinking and reductionist thinking. This third edition contains chapters on personalized medicine and targeted drug discovery as well as the endocrine system that were not in the first edition. Unlike chapters in older books on medicinal chemistry, the chapter on the endocrine system talks about the alimentary tract and adipose tissues, which are now known to be secrete hormones. The importance of environmental toxins in autoimmune diseases is discussed. Practical advice is presented, especially when it helps illustrate an interdisciplinary approach and unexpected connections. The role of environmental toxins, such as bisphenol A (BPA) and perfluorooctanoic acid (PFOAA) in autoimmune diseases is discussed. Also, there are many updates based on research that was published since the first edition. New drugs have been approved and personalized medicine has benefited from next generation DNA sequencing methods. Also, three-dimensional printing was used to make a bioresorbable tracheal splint for an infant who was critically ill. So, advances in genomics, medical imaging, 3-D printing and regenerative medicine, along with increased computational power and the advent of mobile and wireless capabilities are allowing patients to be treated and monitored in ways that better meet their individual needs. There are also descriptions of the basic science behind cancer, heart disease, metabolic syndrome, infectious diseases, inflammation, reproductive medicine, the biology of information flow, the nervous system, immune network, vaccines, autopoiesis, systems biology and network theory. Finally, this and the topics discussed in it should not be taken as reflecting FDA policy or regulations.